Save yourself from the crowds, upped prices, hoards of couples and general Valentine’s Day mania, and have an intimate utterly private dinner date at home instead. There’s nothing more romantic than preparing a specially made meal for your significant other, in a tranquil and relaxed environment. There’s no better way to bond with your partner, or show your appreciation… And as they say, a way to a mans heart is through his stomach. 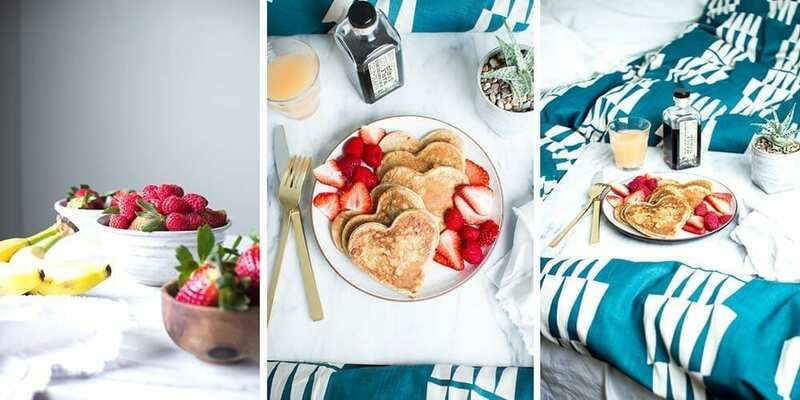 Whether you want to go full-on gourmet meal, a morning retreat breakfast-in-bed or simply a healthy heart-shaped tray of Valentine’s Day treats, we’ve got the recipe for you! Preheat oven to 350F. In a small bowl, mix together flaxseed and almond milk. Set aside. In a large bowl, mix together oats, sunflower seeds, pepitas, almonds, raisins, 1/4 cup chocolate chips, protein powder, honey, salt, and vanilla. Pour in wet ingredients and stir until combined. Mixture will seem dry and not sticky. It’ll be okay. Scoop the batter into a 9 x 6 inch non-stick rectangular baking dish (spray with non-stick spray or line with parchment paper if needed). Spread batter evenly into the dish and bake for 15-17 minutes. Allow to cool in the pan for 10 minutes before cutting out 12 hearts. Melt the remaining chocolate in the microwave or double broiler and use a knife/fork/spoon to drizzle the chocolate over your cookies. Allow chocolate to harden at room temperature. Package and give to the people you love! 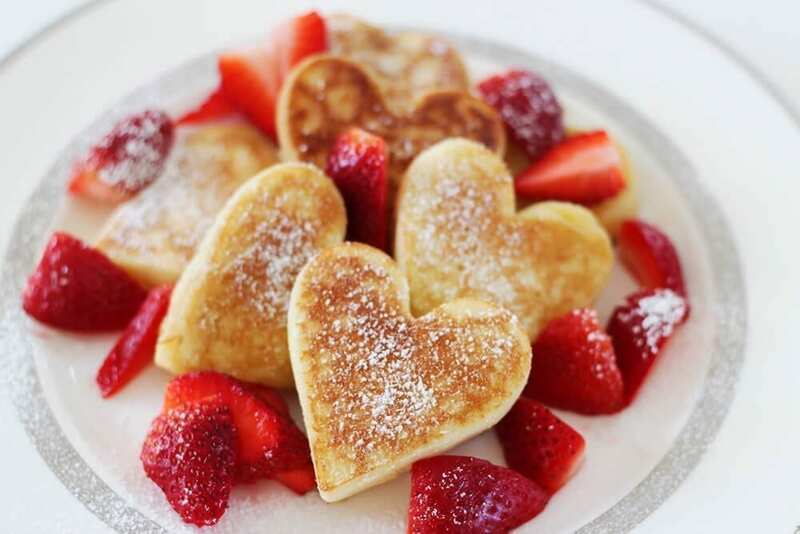 For the heart shaped molds, I used these Norpro Nonstick Heart Pancake Eggs Rings – available at Amazon, but any will do! Preheat a frying pan on medium heat. In a small bowl, combine the dry ingredients. In a medium bowl, combine the wet ingredients. Add the dry to the wet and combine, do not over-mix. Place a small dab of butter in the frying pan. The pan is hot enough when the butter sizzles. Grease the heart molds with butter. Lay them in the frying pan. Spoon the batter into the molds, filling only half way up the mold. Once you can see bubbles forming on the tops of the pancakes, remove the molds and wait a few seconds. Flip the pancakes and cook on the other side until brown. Serve with maple syrup, fresh strawberries and raspberries. With Valentine’s Day just around the corner, when I think of special dinners to cook for your sweetheart, I always seem to default to seafood recipes. That goes for the appetizer course too, like in this incredibly tasty baked mussels recipe. I often have leftover marinara sauce or other simple tomato sauce in my freezer to use in quick recipes like this but if you don’t, any good quality jarred simple tomato sauce will do. A garlic and herb sauce is probably a very good choice. These delectable mussels would make an impressive starter course for your next dinner party too. Prepare them in advance, refrigerate and then pop them into the oven for 15 minutes before dinner is served. You can try this easy recipe with large clams or small oysters too. Wash the mussels and pull off any beards that may still be attached to the shell. A pair of needle-nose pliers works well for this. Discard any mussels with cracked or broken shells and those that do not remain closed after a minute when you pinch them together. Also discard any mussels that do not open during the cooking time. Bring 1 inch of water to a boil in a large covered pot. Add the mussels, cover the pot and let them steam for only 3 minutes to open the shells. Remove the top shell and loosen the mussels from the half of the shells that they are attached to before laying them in a baking dish. Spoon about a teaspoonful of marinara sauce over each mussel in their shells. Over medium heat melt the butter in a small saucepan and add the the garlic. Cook for just a minute to soften it. Add the bread crumbs, chopped thyme and black pepper. Stir to combine well, then toss in the Parmesan cheese. Spoon the crumbs evenly over the marinara sauce covered mussels. Press the crumbs down gently and bake at 375F for 15 minutes. Serve immediately. Start by making the dipping sauce. Finely chop the chilli, then combine with the lime juice (about 2 tablespoons), sugar, fish sauce and 8 tablespoons of water. Pour half into a cute bowl for dunking, and save the rest to dress your lettuce, herb and noodle salad. Smash the prawns with the side of your knife, then finely chop them. Peel and very finely chop the shallot and garlic, then trim and finely slice the spring onions (keep the white and green parts separate). Pick and finely chop the coriander leaves. Pop the prawns, shallot, garlic, coriander and the whites of the spring onions in a bowl, generously season with black pepper and a pinch of sea salt, and give it a good mix. Lay out your wrappers and spoon a teaspoon of filling into the middle of each. Brush the edges of one wrapper with water, fold it in half, then pleat and pinch the edges together to secure. Repeat with the others. You can steam the dumplings for 5 minutes, then fry the base until crispy. But the method I use is how I’ve seen it done in Japan. Place an oiled pan over a medium heat, add the dumplings and a splash of water, and cover. They’ll steam for 2 to 3 minutes, then once the water has evaporated, take off the lid and fry for a further 2 minutes. Cook the noodles according to the packet instructions. Toast the peanuts in a dry frying pan, then crush. Pick off and arrange the lettuce and herb leaves with the glass noodles on two plates, dress with the sauce and scatter the peanuts on top. 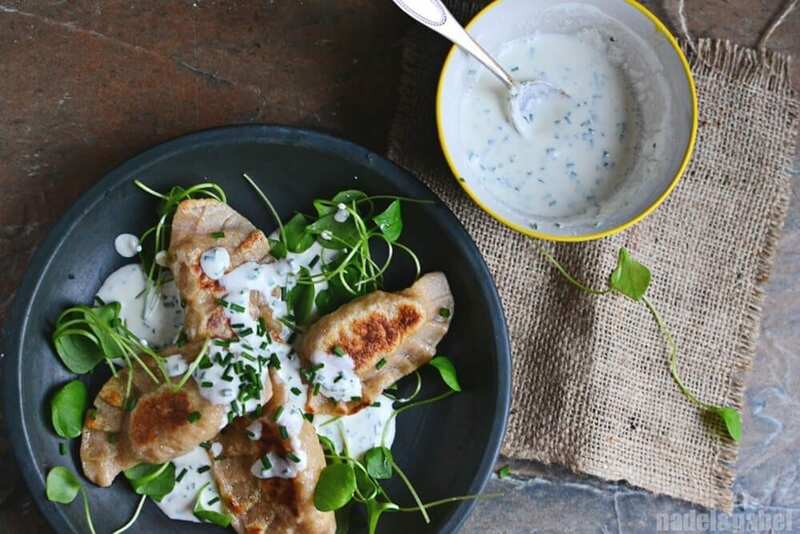 Serve the dumplings sprinkled with the sliced green part of the spring onions, with bowls of dipping sauce and chilli sauce on the side.